Pizzeria Libretto is located in a funky / hip Portuguese neighborhood at the intersection of Ossington and Dundas. The restaurant often gets rave reviews from magazines; it was placed 8th in enRoute's Top 10 Restaurants in Canada for 2009. I'm pretty sure that Pizzeria Libretto is mentioned in many so-and-so's "top lists" but I just don't have time to find them all for you here. Before I go on posting pictures, I have to thank my foodie friend Cindy for introducing me to this place. Although she moved to Toronto from Calgary only a year ago, she has shown me so many cool places to go eat (including Black Hoof). Actually I think she's the one who turned me into the foodie that I am today! Before meeting her, I wouldv'e never imagined having my own food blog. So what's so cool about Pizzeria Libretto? First of all, it has the distinction of having imported Toronto's first real Neapolitan pizza oven! It's a 2,000-kilogram stone behemoth that burns wood and can heat up to 900 degrees F, producing a thin, crispy, blistered crust, with bubbles of charred dough here and there. All pizzas are done within 90 seconds in the oven; it was specifically hand built for the restaurant by a 3rd generation pizza oven maker in Naples. Pretty impressive, huh? Secondly, I love the atmosphere there. It is fun, bright, loud, and lively - not pretentious or uptight at all. Cindy and I even chatted up with a couple sitting next to us at the bar once. Everyone dining there just gives off a really happy vibe. I don't think I'm explaining this well though...you need to go there to understand and experience it yourself . This is the Grand Tasting, where all meats mentioned on the list are served with condiments. The condiments are paired really well. My second favorite appetizer is the bruschetta, topped with the chef's daily creations. Each piece is different, and who knows, you may never get the same toppings there ever again! When the waiter brings over the bruschetta, he/she would explain what each piece is, but I never remember what they are afterwards because I get distracted and wish he/she would just go away so I can eat them ASAP. I actually had the "Buttermilk Calamari" as an appetizer too the first time I was at the restaurant, but I don't think I took a picture of it. I wasn't much of a foodie back then because nowadays, I would even take pictures of complimentary bread. Anyway, I remember the calamari was quite delicious too, and definitely unlike other dry, over-fried, over-battered, calamari appetizers at some other places. 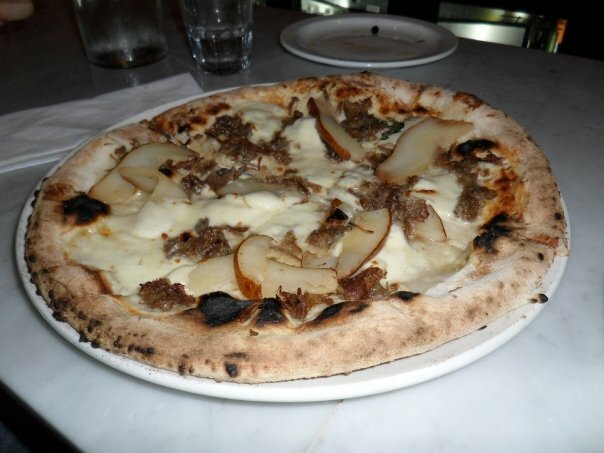 Duck Confit, Bosc pear, Panna, Ontario Fiore Di Latte Mozzarrella.